Angela was born into a singing family and lived in Norton-on-Tees. Her secondary education took place in Darlington where she sang solos in musical productions and was encouraged to wave her arms at the school choir. Her teacher training took place in Hull where she achieved Distinction in the Advanced Music Course. She started her teaching career in Darlington with music as her specialist subject. She continued with singing lessons and developed her choral conducting skills at Summer Schools organised by the Sing for Pleasure organisation, eventually becoming Chair of the South Region and National Vice-Chair with responsibility for developing links with A Coeur Joie, the francophone international choral organisation from which Sing for Pleasure sprang and which has made her a 'Temoin Majeur' (Major Witness) to the philosophy of Cesar Geoffray who founded A Coeur Joie in 1945, one of only about 40 people so far to receive this award. 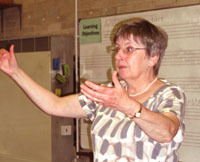 A teacher's supplementary year at Trinity College of Music led to a Licentiate Diploma and Angela becoming Head of Music at two large comprehensive schools in the London Borough of Brent where she founded a multi-racial Youth Choir and organised singing holidays and participation in Festivals in Belgium and France in addition to conducting on singing days, weekends and Summer Schools in England. On moving into school senior management (and acquiring an M.A.) her music-making became an evening activity with Adult Education groups in Brent, Harrow and Chelsea. Whilst Headteacher at Heston Community School in Hounslow, and somewhat to the surprise of colleagues, she organised Neighbourhood Festivals for which she rehearsed singers from primary, special and Heston school and the local community who performed their own items and sang together in a massed choir. She also led massed primary school choirs in Hounslow local authority festivals. Having returned to the North-East, Angela retains her links with Sing for Pleasure through her 'occasional choir' of adult singers from many areas of the country which meets six or seven times a year near Tring in Hertfordshire. The group have participated in visits to France, Poland and Rumania, singing holidays in the Lake District, Scarborough and France and hold an annual Bank Holiday House Party weekend at the beginning of May. She also leads a Singing for Pleasure group in Stokesley U3A that welcomes singers of all backgrounds and experience and has 70 people on its register. Angela is delighted to have become Music Director of Guisborough Choral Society. Being able to teach and conduct larger choral works fulfils an ambition previously impeded by school management responsibilities. She believes that singing is a source of joy and well-being and that choral singing can transcend barriers of age, background, language and nationality and provide fellowship for all who take part.